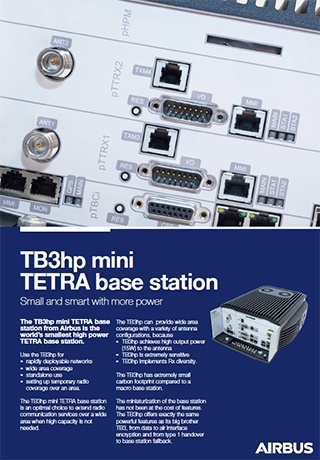 The TB3hp is the world’s smallest high power TETRA base station. It is about the size of a laptop – only a little thicker and heavier. The TB3hp provides up to 15W radio frequency power with very low power consumption. One person can easily carry the TB3hp to the site, install it and set it up within minutes. When it is up and running, you can operate and maintain it over a remote connection. There is no need for costly site visits. Carry the TB3hp with you to cover an area temporarily. The TB3-series base stations can help you with the challenges. They are sensitive and powerful. Use them to build excellent radio coverage without black spots very cost-effectively. You can choose a one-carrier or a two-carrier variant of the TB3hp mini TETRA base station.